At our Manchester hire studio when we say to clients who need to film interviews or film pieces to camera that we have an Interrotron we are usually met by a stoney silence. That or palpable fear. “What on Earth is an Interrotron?” They ask. The easiest way to explain is by example. Most people are familiar with the sensation of suddenly getting a camera thrust in their face and becoming speechless. You can be the most confident person in the world but when the unblinking eye of a video camera stares at you most are lost for words. The reason why is that unlike a normal conversation, where your responses are met with nods and smiles, the lens of a camera gives nothing back, no nods, no smiles, not even a disagreeing grunt. Without this two-way exchange, most conversations filmed this way are awkward and embarrassing. That is why most interviewees are asked to look off camera to the left or right at the interviewer who at least can agree along with the speaker. Unless you’re media trained this is the standard way of conducting filmed interviews. Yet recently on TV you’ll see that Joe Public is looking right down the lens, laughing, joking, emoting; effectively talking directly to the audience. So what happened? Did everyone get media training while you were asleep? No, the answer is the increasing reliance on devices like the Interrotron and Idirect. Designed by Errol Morris for documentary use the Interrotron, like that available to hire at our Manchester studios, is effectively two autocues joined together but instead of displaying words the Interrotron displays the faces of interviewer and interviewee respectively. This allows for 2-way conversation with eye contact maintained between both parties but, as their conversation is being relayed through cameras, then the exchange is filmed; making for a much more natural and engaging flow for pieces-to-camera. As mentioned the Interrotron allows for a relaxed interview scenario bringing the best from your contributor. With people, in general, being so used to Skype, Facetime and video calls the simple set-up of the Interrotron system is unintimidating. By maintaining eye contact with the interviewer they keep eye contact with the camera, and, therefore, to the audience watching either on TV, video or web, it builds trust. The Interrotron has advantages over its rival Idirect in that as it uses a camera, rather than a mirror, to conduct the interview, which means interviews can be done remotely with directors “dialing in” to speak to their contributors. This can be a real bonus if contributors are at multiple locations or only available at short notice. Our soundproof studio is the perfect home for your interview filming offering uninterrupted filming for your projects resulting in outstanding productions of true merit. 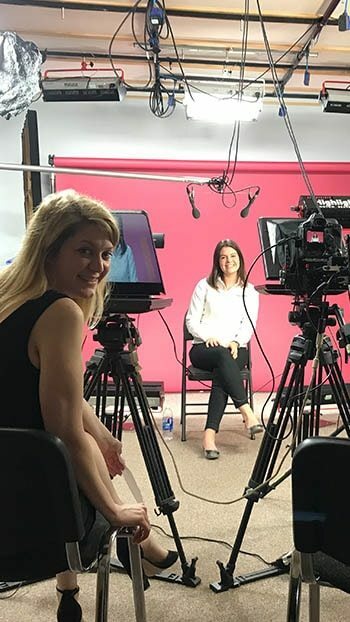 As well as the benefit of “dialing in” to film interviews or pieces-to-camera Galleon Studios also allows interviewer and contributor to chat in different studios on site. This is useful if the writer or producer wish to add any new questions they want the interviewer to ask and they can be discussed without stopping the interview dead. These private conversations, away from the contributor, can help mold the production to get the best result without the contributor feeling the pressure to perform. 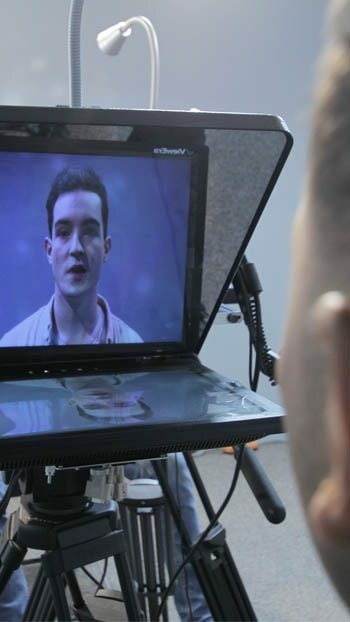 There are many benefits to using our studio Interrotron the next time you need to film an interview in Manchester. Hopefully, this answers all you need to know about the popular, and it turns out, not at all terrifying Interrotron. Galleon Studios is pleased to offer the Interrotron with everything you need to film the perfect interview.